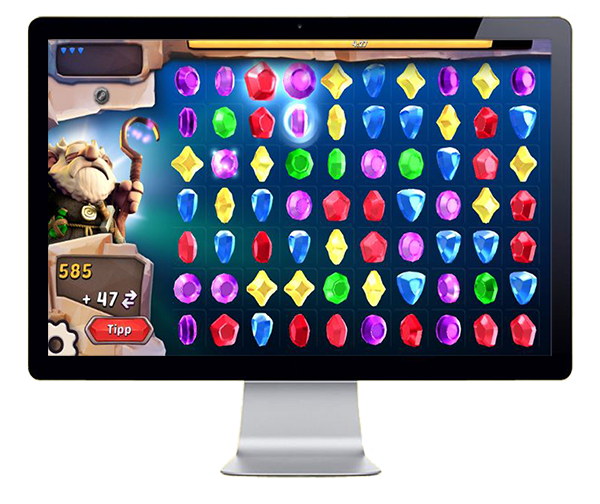 In this popular match 3 game, your goal is to collect as many jewels as requested in the target and to achieve the highest score within the time limit. There are some special jewels, and the more you collect them, the more you will receive extra points. Have fun helping the magician collect all of the shining objects in each of the 5 levels available for this game! Switch 2 jewels in order to put 3 or more of the same colored ones together in a line. Get the right gems in order to unlock the stars. In each level, you will have a target that tells you how many stars you need to collect. You can use special gems to help you out during the game (for example, some of them can destroy more gems at once, or even make the clock stop). It’s also possible to click on “hint” so the game will give you suggestions for moves.